Nothing says summer like watermelon. They cool you off, hydrate you and fill your stomach on a hot summer afternoon. Also, they’re the perfect dessert for any BBQ or picnic menu. I love coming up with new ways to use summer produce that cool you down and taste delicious. 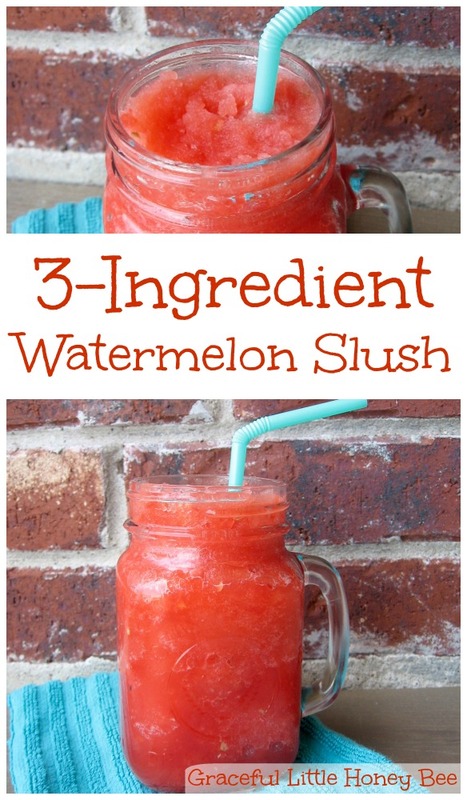 This watermelon slush is easy, tastes awesome and will definitely quench your thirst! I tried making it using fresh watermelon and ice, but the consistency wasn’t what I was looking for so I decided to freeze the watermelon and see if that made a difference. It definitely worked, producing a silkier more even consistency, so the next time your cutting a watermelon just throw three cups in a freezer bag to have ready whenever you want to make your slush. Step 1: Blend all ingredients until smooth. You may need to adjust the amount of water to get the consistency that you prefer. Step 2: Pour into glass, sit on your porch and enjoy! What’s your favorite summer time drink? Blend all ingredients until smooth. You may need to adjust the amount of water to get the consistency that you prefer. Pour into glass, sit on your porch and enjoy! Perfect timing! We just got a watermelon over the weekend and it wasn't as tasty as we like. So I think I'll make a slushy out of some of it! What a great recipe! Very popular among my 4-year-old and his friends when they got back from a hot and dusty day in day care today. Hopefully our summer here in Denmark will last long enough for us to make plenty of slush ice :) I was thinking that frozen pineapple might work as well? Tina, I'm so glad you enjoyed it! Watermelon is mostly water so it works well. Pineapple may end up thicker and have more texture to it, but you could definitely try! This sounds delicious! Thanks so much for sharing Missy. Have a lovely weekend. Thanks for sharing this recipe, Missy! It sounds delicious and the perfect solution for the last of the watermelon no one wants to finish! :) I can't wait to try it with my kids.